As the New Year dawns, here is our annual list of wishes for the coming 12 months. • May Gov. Kate Brown recognize her political legacy will rest partly on how well she can tame ballooning costs of the state pension system. Now that she's freed from having to run for re-election, let's hope she sees that trimming pension costs is not anti-worker when it means saving more teachers', firefighters' and state workers' jobs. • Bipartisanship has been abandoned in Washington, D.C., but it has been alive and well in Salem up until now. With Democrats holding supermajorities in the Legislature, we hope they don't fall back on the easy route to "yes." Dems have the chairmanships, the gavels, the speaker's office and the Senate president. They've got Mahonia Hall. It'll be up to them to say: This idea is good, but if we want it to stand the test of time, let's make sure our Republican friends get their say, as well. • We're rooting for an economy healthy enough in 2019 to bring enough tourists to Portland to fill all of those hotel rooms coming online. • Let's hope for an end to the Portland schoolyard-style fights posing as political protests, caused by both sides who can't resist the opportunity to provoke and retaliate against each other. • We'd like to see a recognition that both sides in the residential density fight are legitimate and should not be demonized — neighborhood character will be changed by abolishing single-family zoning, but more people will have an opportunity to live in desirable parts of the city. • Let telecommuting flourish — along with binge-watching — so that the dreary freeway slog becomes optional. We'll be watching how Hillsboro's city-owned, reasonably priced internet service does. Internet as a utility is the future. • Maybe there will be an end to the constant refrain from city officials that Portland is leading the way on environmental/urban/transit/etc. innovations, and that delegations from around the world are visiting us to understand how we are doing it. Those of us who live here know things don't always work out as planned. • May the late Paul Allen rest in peace after making an indelible mark on Oregon's sports history. During his 30-year tenure as the Trail Blazers' owner, he was the driving force in the construction of the Rose Garden (now Moda Center), provided resources for a perennial playoff team, and donated many millions to charities in the Portland area. 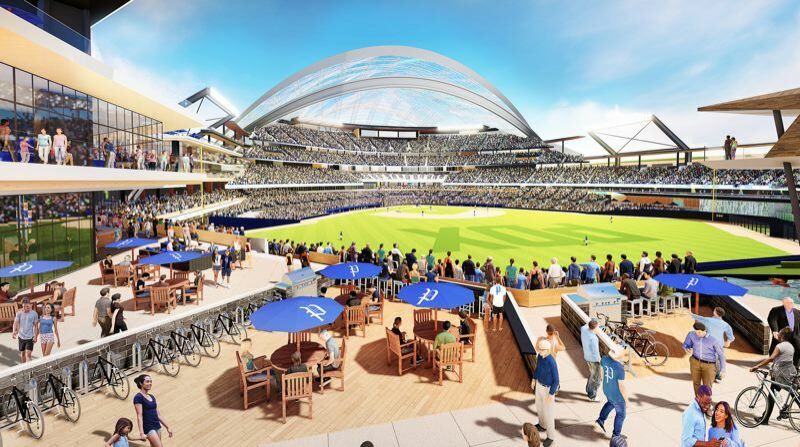 • We're cheering for the Portland Diamond Project as it slowly weaves its way through the complicated process of getting a Major League Baseball park built. Signs point to the possibility of an MLB club coming to town as early as 2023. • May the city council, the Bureau of Development Services and Portland Bureau of Transportation — none of which ordinarily are tagged as business-friendly — start regulating "sharing economy" giants (i.e. Uber and Airbnb) with the same rigor they apply to other businesses, and stop rolling over for companies valued in the tens of billions of dollars. • For architecture, engineering and construction firms, there's usually either too much work or not enough. Here's to 2019 being the year that everyone has enough projects to keep busy while still finding some well-deserved time to breathe. • And while they're at it, may our architects dream big and try designing a few truly world-class buildings that are a joy to inhabit and that attract tourists. And may the city's Design Review Board let them. • Pat Casey deserves a little less stress in his life after coaching Oregon State to its third national baseball championship since 2006 and then retiring to escape (at least temporarily) from the 24/7/365 grind of coaching major college baseball. Best of luck to his successor, longtime associate head coach Pat Bailey. • May the Portland Thorns and the Portland Timbers, both of which made it to their league championships in 2018, continue to play at the top tier of professional soccer in 2019. Regular sellout crowds have the teams expanding Providence Park by 4,000 seats to a capacity of more than 25,000. • At the risk of sounding self-serving: We wish people would realize the importance of independently gathered, professionally curated information about their government. Our industry needs to thrive and proliferate because we need more watchdogs — not fewer. • Here's hoping Mayor Ted Wheeler ends 2019 with better reviews than 2018, and that he harnesses the energy of his increasingly activist council mates to reach productive consensus — and lasting progress. And while we're talking city council, let's all hope Commissioner Nick Fish's biggest success is a personal one: victory over cancer. • A better understanding of transportation would be nice. Every option needs to be supported to reduce the congestion that is strangling the region, including: freeway expansion, increased transit and more and safer bike and pedestrian paths. • It would be terrific if Portland Public Schools could bring just one major school renovation project in under budget. • Hundreds of millions in public housing bond money is about to be spent. Thousands of newly built private-sector apartments are coming online. And the Metro council is expanding the urban growth boundary. Is it time to believe that finally, just maybe, Portland-area housing costs will start to moderate? • We hope citizens will get involved and informed before they get outraged, and that they examine their frustrations and biases before assuming people are acting in bad faith. • State Sen. Rob Wagner wants to introduce legislation making Oregon the 11th state to mandate Holocaust and genocide education. Normally, we're not fans of noneducators telling teachers how to teach. But we live in a world in which a loud contingent of people deny the Holocaust. We have to make sure no one forgets the horrific lessons of the Nazi era. School districts should adopt standards for teaching about the Holocaust and genocide. There's a Hebrew phrase: "zikhrono livrakha." It translates as, "May their memories be a blessing."